All the buzz about the Northwestern University "Wildcat" Marching and Basketball Bands. IN THE SKIES OVER KANSAS — "We should have plenty of sunshine and a real nice trip," says Daniel Farris, director of the Northwestern University "Wildcat" Marching Band. 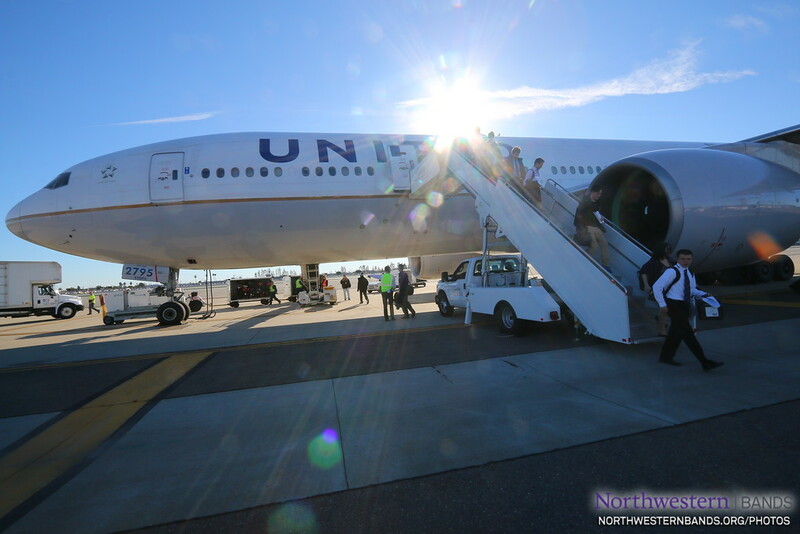 The band, along with cheerleaders, university staff, and distinguished guests, have taken to the skies on their way to support Northwestern's football team at the 2018 Holiday Bowl in San Diego. The musicians are wide-eyed as they receive first-class service aboard the chartered 777 aircraft, complete with hot towels. The three-course lunch includes chicken parmesan or a teriyaki stir-fry, served with a spinach salad followed by frozen yogurt. EVANSTON, ILL. — "When the band’s announcer had to leave early for one game, [Pete] Friedmann filled in for him as the post-game announcer," reports Savy Leiser in the latest edition of Halftime Magazine. 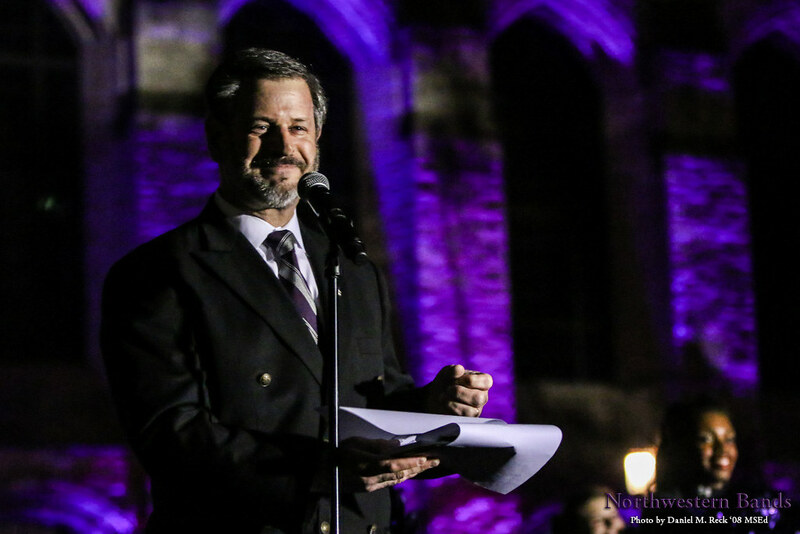 It was a fateful moment that eventually led to Friedmann's appointment as Voice of the Northwestern University 'Wildcat' Marching Band. EVANSTON, ILL. — Pete Friedmann ’79 will be honored by the Wheaton Municipal Band tomorrow evening as they perform "The Friedmann Fanfare" during an entire concert dedicated to celebrating his 35th season as their announcer. 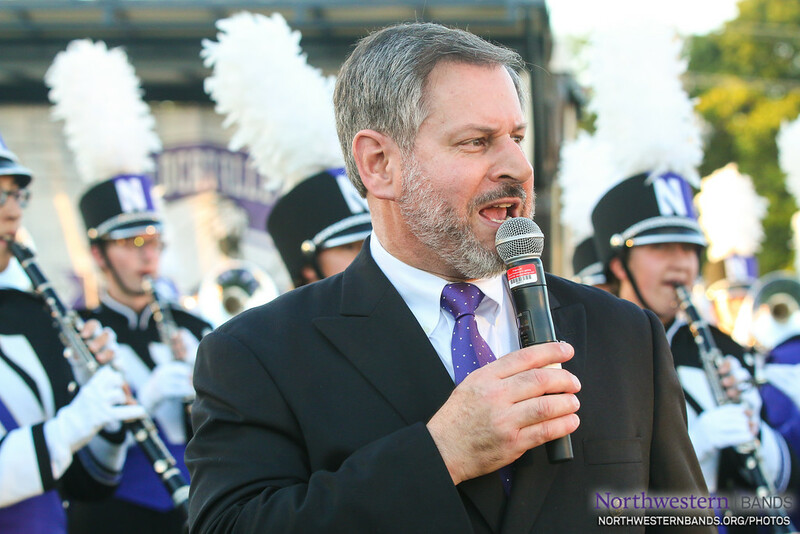 "Friedmann auditioned for the announcer role 35 years ago after being 'discovered' by Wheaton Municipal Band Music Director Bruce Moss" when Friedman became the Voice of the the Northwestern University "Wildcat" Marching Band in 1981, reports Eric Schelkopf in today's Suburban Life newspaper. 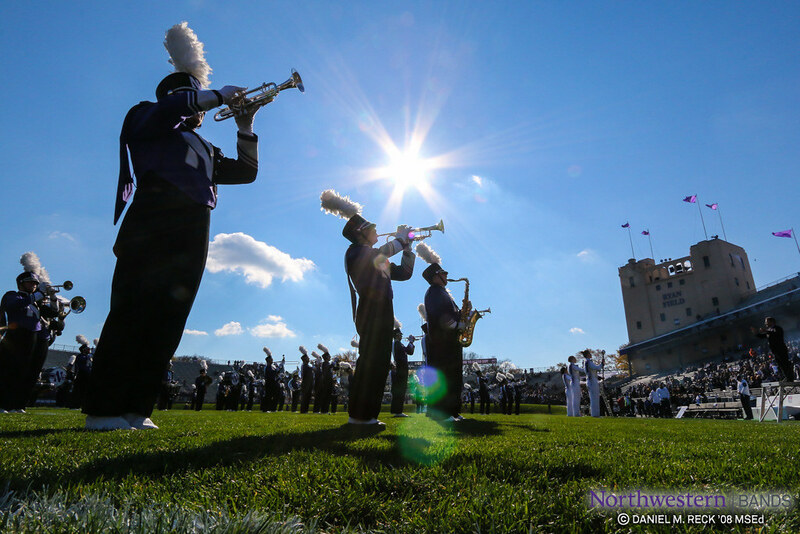 MAY 18, 2016 — EVANSTON, ILL. — The performance and rehearsal schedule for the 2016-2017 Northwestern University "Wildcat" Marching Band has been announced. It will be an exciting season that includes a road trip to Ohio and visits from the Nebraska and Illinois State Marching Bands. These performances, rehearsals, and events are expected attendance events for all marching band members, who should register now to participate in the 2016-2017 season. DECEMBER 29, 2015 — IN THE SKIES OVER NASHVILLE, TENN. — "Welcome aboard for non-stop service to the Outback Bowl!" 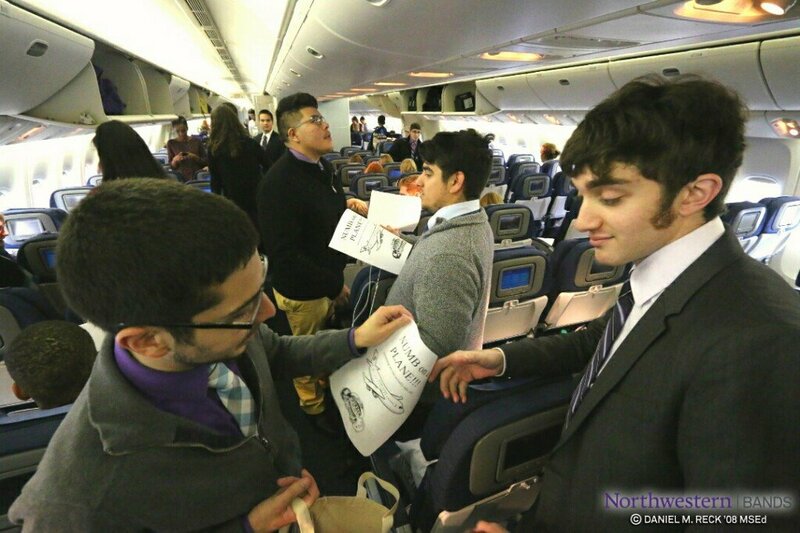 The United Airlines flight attendant's announcement received cheers from the Northwestern University "Wildcat" Marching Band, cheerleaders, and guests as the plane prepared for take off to Tampa Bay, Fla. Severe weather yesterday cancelled or delayed thousands of flights, but the Wildcat Band's rehearsal went on as scheduled last night. "We're communicating with everyone," says Director of Athletic Bands Daniel J. Farris. "We'll meet some people in Tampa. We want everyone to arrive safely." Even with a bit of "heavy dew" induced tardiness, the musicians warmed up their instruments and ran throug their newest piece: The University of Tennessee fight song, "Down the Field." Wildcat Band Sets Homecoming Beat on ESPN, ABC, "Mike & Mike"